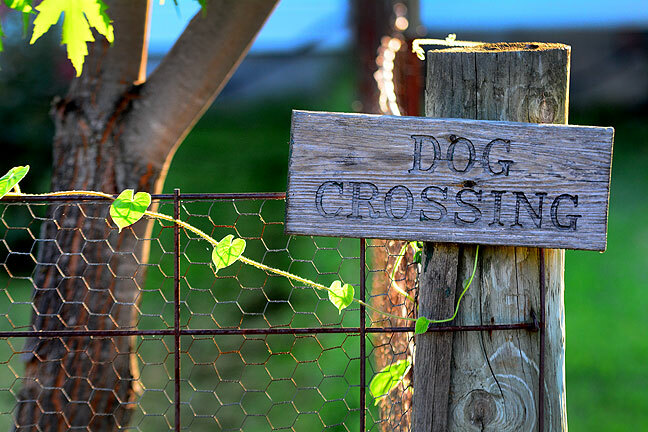 Abby’s “Dog Crossing” sign at the northeast corner of the front yard sits just beneath the maple I dug out of Dorothy’s yard five years ago and planted in our yard. The vine is morning glory. 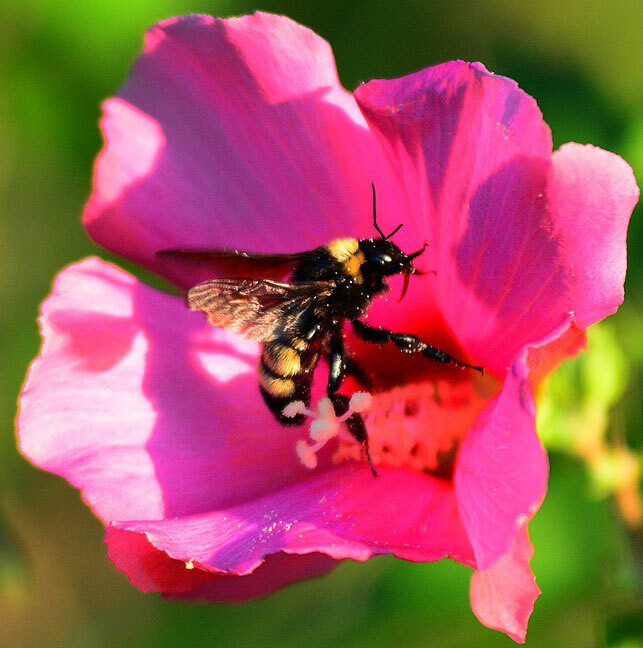 A bumblebee harvests pollen from a Rose-of-Sharon flower. After mowing and string trimming last night, the light was amazing and everything was very healthy and green, so, as I often do in the evening, I grabbed a camera. The setting sun was being particularly playful with the morning glory and the maple leaves. I poked around in the garden and back yard for a few, where I found some nice mimosa blossoms. I then moved around to the driveway, where I saw a dozen or more bumblebees harvesting from the Rose-of-Sharon flowers. As I photographer them, I saw one that appeared dead, and only upon closer examination was I able to see that it was being consumed by a wheel bug. 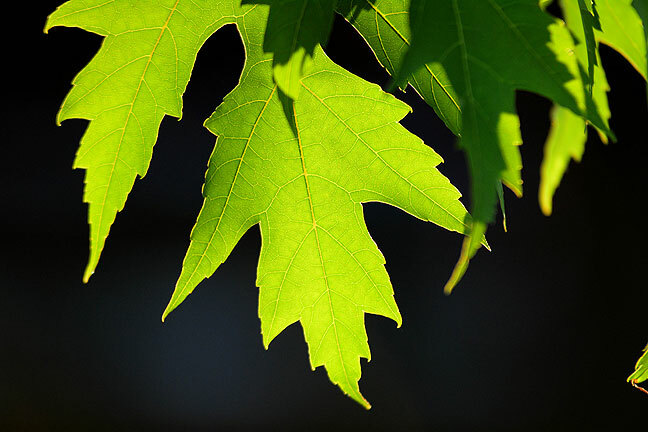 Evening sunlight shines through a cluster of maple leaves. As sad as it was to see one of my favorite insects, the bumblebee, get killed, it was edifying to see nature’s way. 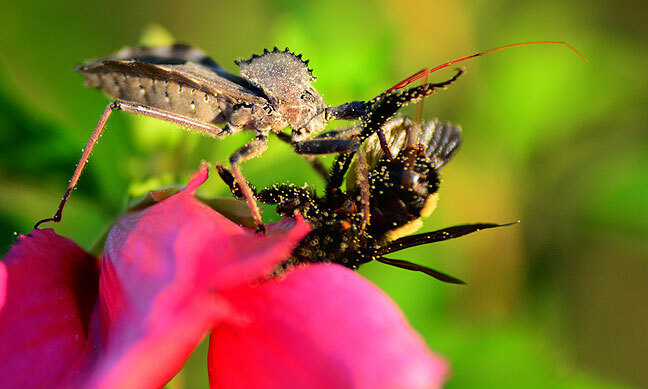 A wheel bug consumes a bumblebee after killing it atop one of our Rose-of-Sharon bushes last night. It’s images and information like this that expand our minds and enhance our preception. By this angle, I could be another insect watching. The reality is so strong I am comforted in the frames edge separating this moment from my present. The artistry and craft here is so seemless as to be invisible. All we feel is the horror and wonder.